Another great Traverse City project in the making! 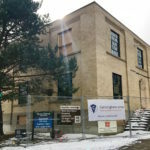 Cunningham-Limp is excited to be part of the team renovating a 72,000 square-foot building that will become a mixed-use development hosting new Munson Healthcare offices and residential condominiums. Read more about this projects in the article below!